Chaloner Primary, Galley Hill Primary, Belmont Primary, Highcliffe Primary and St. Paulinus Primary of Guisborough (project’s home town) have been inspired to participate in The Schools International Peace Quilt as an extension of the flagship/Mother project. For each Country and even district of each Country to become involved exploring ideas around their expression for Peace and ultimately creating their very own Quilt message would be the perfect next step for this remarkable project. Also there is the huge potential for schools to learn about the many cultures involved plus inspirational stories of the project through the information gathered here. From the Guisborough schools during and after their visit to our venue The Methodist Guisborough, we received many submissions from which we have selected some for this page. The response from the children and schools was very encouraging. “Many many thanks for letting us come to see the Peace Quilt. It was truly inspirational and astounding how much effort and work you have all put in to ensure the success of the project. The children were engaged and inspired and will be fascinated to absorb the story behind the Quilt when we look at the power point. A billiant message which will remain with the children for a long time… Never give up on your dreams. I am so glad to have seen the Peace Quilt and all that it represents. A massive thank you to all involved.” Tricia Belmont Primary. This is a poem we received from Eleanor Y5 attending Galley Hill Primary which she wrote while observing the Quilt on the schools recent visit. 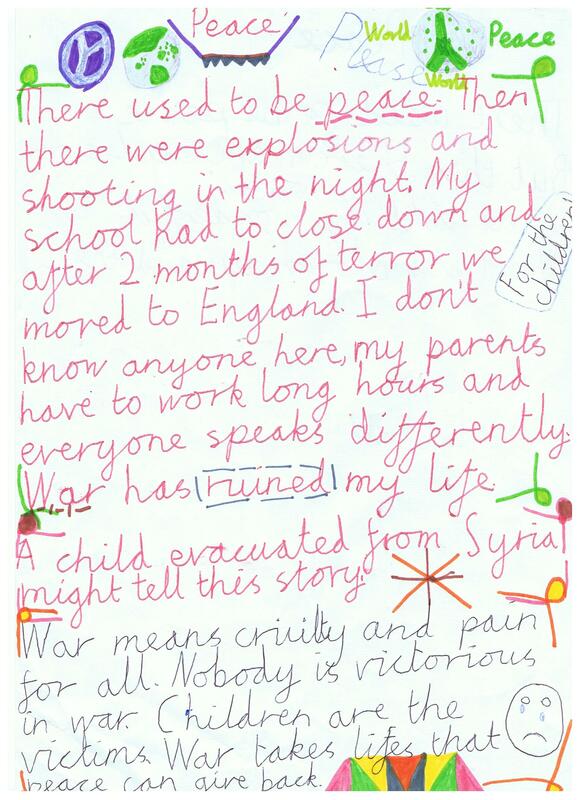 This is all the more amazing as Eleanor from Guisborough has wrote this through the eyes of a Syrian student. “There used to be peace then there were explosions and shooting in the night. My school had to close down and after 2 months of terror we moved to England.I don’t know anyone here, my parents have to work long hours and everyone speaks differently. War has ruined my life. A child evacuated from Syria might tell this story says Eleanor. 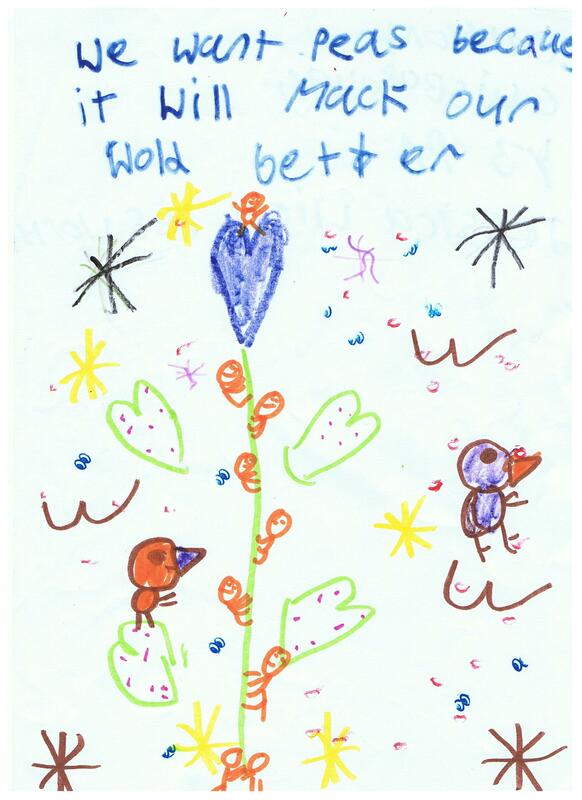 Jessica yr1 from Chaloner Primary school drew this design in response to viewing the Quilt. We want peace because we want the peepl to stop fiting stop. Jessica Y3 from Belmont school and Molly Y5 from Highcliffe Primary also produced these designs in a few minutes while observing the project. Thank you to them both. We want Peas because it will mack our wold better says Jessica. 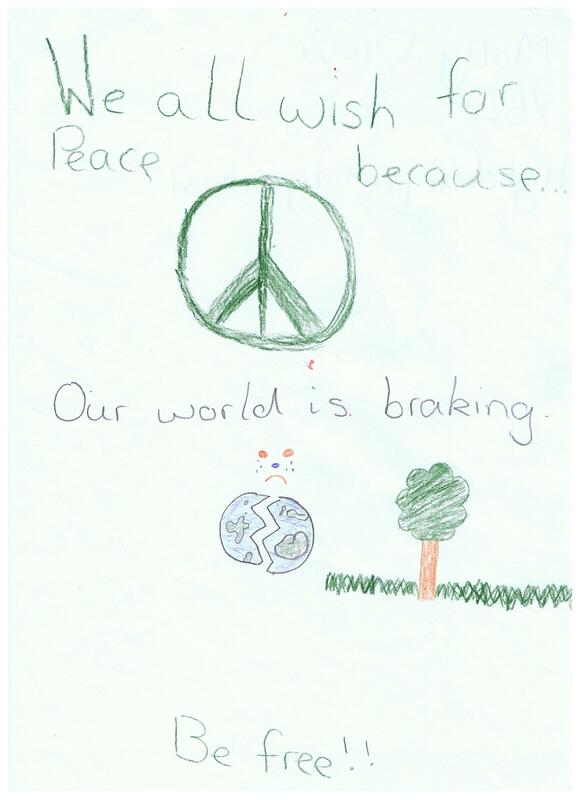 We all wish for peace because Our world is braking. Be Free !! says Molly. 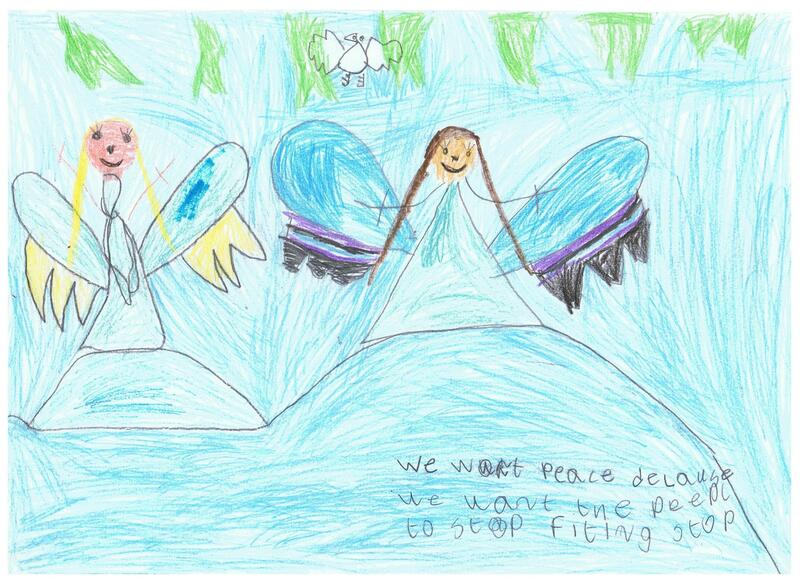 Elen from Y1 in Galley Hill created this design after visiting the School’s International Peace Quilt Project. 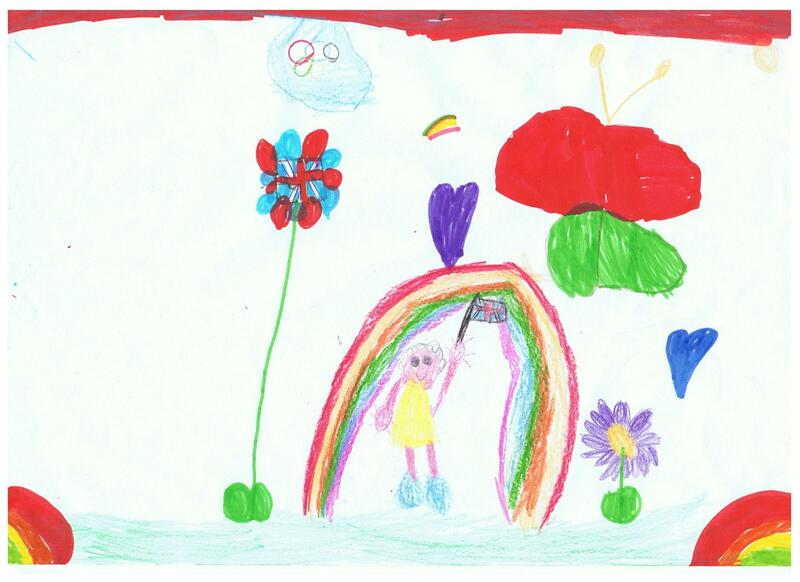 Elen has drawn a rainbow which is a symbolism of Peace and I guess that is possibly Elen under it feeling safe holding her Countries flag. Thank you so very much to all these students and the many others who took part. It was a memorable experience for the IPQ Team plus the Methodist volunteers who helped it all happen. We hope it was memorable for the Guisborough Schools too. Here we see an example of the thought provoking element of this project. The children have produced some wonderful art work for the different age groups and have put thought into either their writing or design. Many Countries art teachers involved in the Mother project have said their students have produced some of their best work for the year through the IPQ. Children and young people can only do this if they are inspired or very passionate about something. Would you say that young people are passionate about Peace and living together in harmony while learning about each other’s culture ? ?